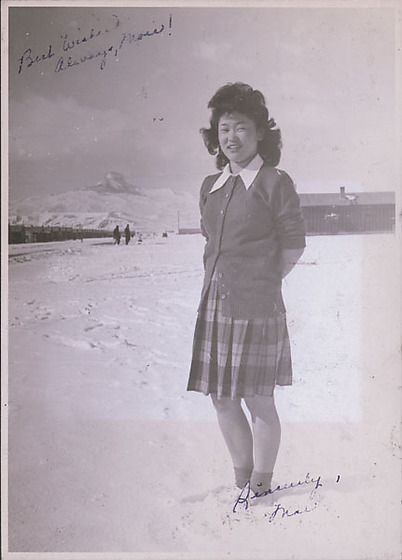 Portrait of a young woman, Mae Suzuki, standing in the snow with Heart Mountain in background at Heart Mountain concentration camp, Wyoming, Winter 1944-1945. She wears a plaid skirt, blouse and cardigan sweater. Her sleeves are pushed up and her hands are behind her back as she smiles directly at viewer. Her hair is curly and very full. There is one barracks at midground right. Two people stand at midground left in front of a row of barracks. Heart Mountain rises in background left. Written in black ink on image: Best wishes / Always Mori! / Sincerely, / Mae. Written in pencil on back, BRC: MY BEST SNOW / SCENE / ALSO SUPER / SUBJECT MAE SUZUKI / MORI SHIMADA.